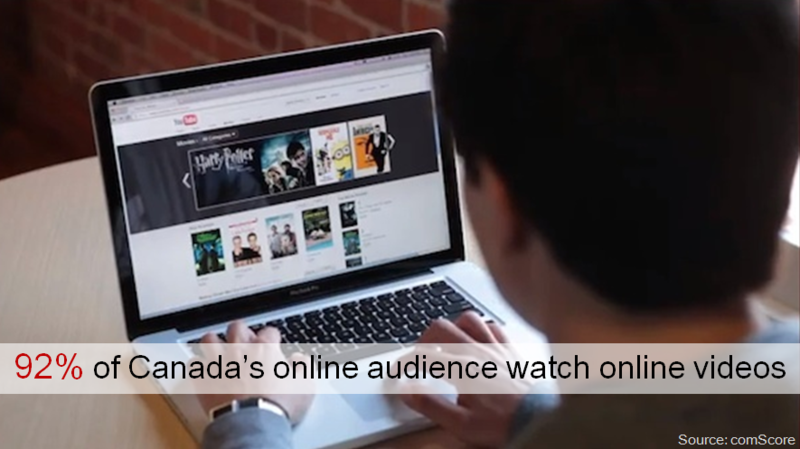 Canada’s appetite for online video is among the highest in the world. According to a recent comScore study, every month Canadians watch an average of 291 online videos, totalling 24.8 hours of viewing per person. As consumers’ viewing habits shift from TVs to smaller screens, businesses are taking advantage of the growing popularity of online video by creating and sharing their own branded video content. 81% of marketing professionals surveyed said they’ve used video in their online marketing strategy, up from just 70% in 2011. In a different survey of B2B marketers conducted by Software Advice, video was revealed to be the second most popular type of content or offer used for demand generation. Not only is online video popular with consumers, it can also be inexpensive to produce (online videos don’t need the huge production teams or big budgets that traditional TV commercials require). So no matter what size your business is, it’s time to start creating video content that resonates with your target audience. First things first, you’ll need a plan. The #1 mistake to avoid is producing all of your videos on whim. Sure it’s fun to put together a video for something topical every once in a while, like an office version of the harlem shake. 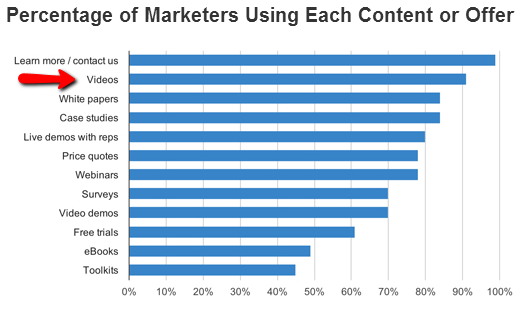 But if you’re creating videos as part of your content marketing strategy, they need to be well thought out and provide value to your audience. Sporadically posting low quality content won’t do much to help your brand, and will ultimately be a waste of your time and energy. The type of video you go on to produce will be directly related to the goal you’ve set for it. And no matter what type of video you choose, you’ll have more success if you make sure that your content is unique. Case studies are a great way to let potential customers know what types of results your product or service has been able to achieve in the past. But instead of simply telling them about your successes, why not show them? YouTube’s Channel for Advertisers created a video case study showing how YouTube was able to help the camera brand GoPro expand globally. You’ll notice that their case study includes music, voiceovers, and video editing. These technical aspects of producing video case studies are something you’ll have to consider; do you have someone in-house who knows or is willing to learn basic editing, or will you outsource these projects? Interviews are a great way to make connections within your industry, and interviewing an industry leader can help you boost your own business’s authority. It can also help you increase your reach since the person you interview will likely want to share your video with their social network. Interviews can be internal or external, informal or serious. While keeping your videos short helps ensure they’re viewed from start to finish, if your content is compelling enough, your viewers will keep watching. HubSpot chose to do an in-depth interview with Moz CEO Rand Fishkin as part of their Inbound Now series (total video length: 30 minutes). Another option for a lengthy interview is to release it in parts, and create multiple videos. Testimonials can be an effective way to persuade potential customers to make a purchase. Many companies include written testimonials from past customers on their websites. Video testimonials featuring real customers are even more convincing, and act as “proof” that your company offers satisfying solutions. IBM has created a variety of simple video testimonials for a number of their B2B clients. For a B2C example, see the weight loss success story Curves gym chose to share in video format. This type of emotional appeal couldn’t have been conveyed as effectively through text alone. Add variety to your business blog by creating videos featuring a member of your company discussing industry related tips, news, or advice. These videos don’t have to be a deep dive, but should be about as long as it takes to read a blog post. Marc Nashaat, an SEO expert and inbound marketing consultant at Powered by Search, discussed emotional marketing in front of a white board featuring relevant visuals. One of the things that video content allows you to do is create product demos. This is a great way to educate consumers on your product in a more dynamic way than simply using text and images. Samsung created an official demo video for their new product, the Galaxy Tab 10.1, and also released a short version (just 2 and a half minutes long) for customers who didn’t want quite as much information. A webinar is a seminar conducted online, with viewers watching (and sometimes interacting) in real time. Once the live webinar has ended, you’ll be left with a video recording you can do one of two things with. This is where having an end goal before producing your video really helps. If you’re goal is to generate leads, you can make your webinar accessible through your website for free after visitors have provided their name and email address. Alternatively, you can post your webinar on your company’s YouTube channel in an effort to reach a wider audience, and position your brand as a thought leader. For instance, Google chose to make their Getting Started with Google Analytics Webinar available for anyone to view on YouTube. Just like with any type of content you create, simply making a quality video doesn’t guarantee that people are going to find it. Leverage your company’s social network by sharing your video with your fans and followers. 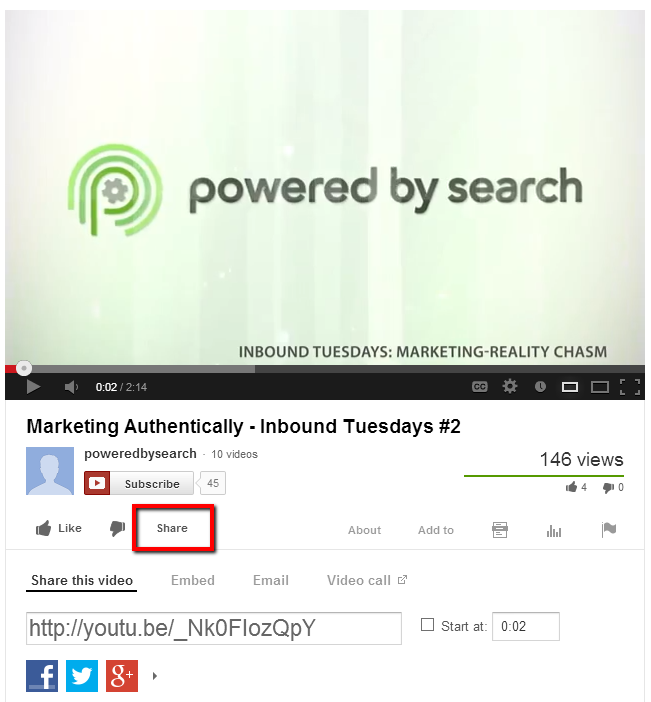 If you’ve posted your video on YouTube, include it in a company blog post too. You can also help your videos get found naturally by optimizing them for search engines. While search engines have come a long way, they still can’t crawl the content of videos, so you need to provide other text clues to help them understand what your video is about. Google suggests creating a transcript of your video, or providing a detailed description inside your HTML. You should also choose a catchy, descriptive title that quickly lets both viewers and search engines know what to expect from your video. Choose the keywords that you want your content to rank for, and make sure to include them in the title, tags, and metadata. Take advantage of the fact that YouTube allows for short text descriptions for each video, and make sure to include a brief summary or key takeaways when posting videos to your blog. One last tip: measure your results and learn what works best with your audience. Not sure what to track? Check out Marcela De Vivo’s article on measuring reach, engagement, and conversion for social media marketing (including YouTube). Once you find a winning formula, you’ll wonder why you didn’t add online videos to your content marketing strategy sooner. About the Author: Brittney Stephenson is a Marketing Assistant at Powered by Search with a special interest in social media, marketing strategy, and market research. Search engine marketing expert with 15 years of experience in the industry, working with small mom and pop shops as well as large corporate websites. 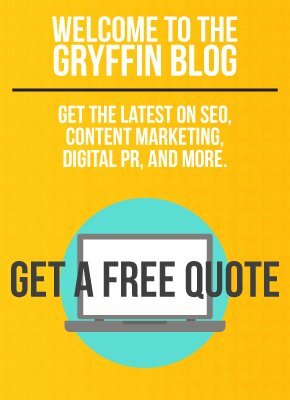 I have experience with all aspects of inbound marketing, including SEO, Link Building, Social Shares, Usability, Conversions, PPC, Email Marketing, and more.